Even though 2016 is almost gone I decided to make this list. Please help me correct it. I need confirmation about it. 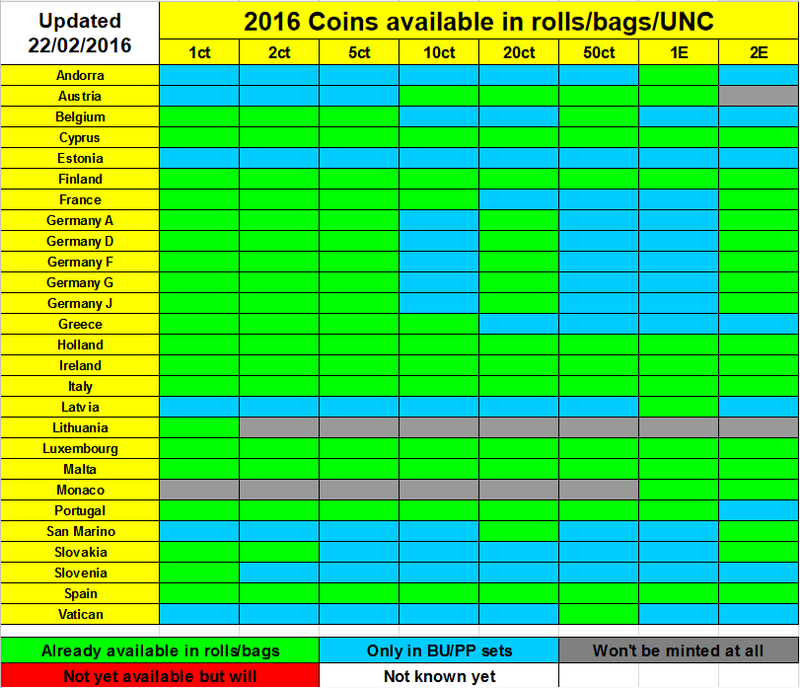 I made the list with all the information I gathered with the coins that will be available in rolls/bags and the coins in BU/PP only. Please contact me if you have something to add or change. I hope it will help the collectors who collect by year. Last edited by BadVariemai on Wed 22 Feb 2017, 17:02, edited 1 time in total. Are you sure? Where did you find this information? When this happened? In December I received some sets and there wasn't the 50ct. But I'll ask my Portuguese friends again. I wrote to Portuguese Mint and they confirm that 50c PORTUGAL 2016 was minted for circulation. I will try to get it. A friend from Portugal showed me the official paper with the mintage. It's sure. Thank you all for the updates. I hope now the list is ok.